KHD Valves Automation Pvt Ltd is a High Quality Butterfly Valves Manufacturer in Mumbai, Maharashtra, India. 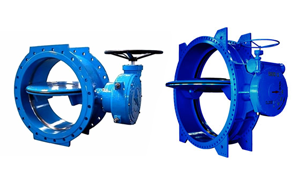 We are a leading manufacturer of Butterfly Valves in Mumbai and nearby areas. Our Butterfly Valves are manufactured according to International ASTM ANSI Standards, ASTM API Standards, ASTM DIN Standards in India. Mail us for Easy and Quick Quotes at Factory Prices. A Butterfly Valves is a Valves that isolates or controls the flow of a fluid. The closing mechanism is a disk that rotates Its operation is similar to that of a Butterfly Valve, which allows for quick shut off. Butterfly Valves are generally preferred because they are cost effective than other Valves designs, and are lighter in weight so they need less support. The disc is positioned in the center of the pipe. A rod passes through the disc to an actuator on the outside of the valve. Rotating the actuator turns the disc either parallel or perpendicular to the flow. Unlike a Butterfly Valve, the disc is always present within the flow, so it induces a pressure drop, even when open. KHD Valves Automation Pvt Ltd's concentric Butterfly Valves are designed and manufactured to have a mix of structural solidity, flow regulation, and effective sealing. 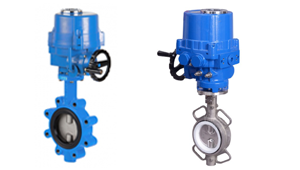 KHD Valves Automation Pvt Ltd's Double-eccentric Butterfly Valves are designed in a way that the disc and shaft are connected by means of a key and a keyway. KHD Valves Automation Pvt Ltd's triple-offset Valves (TOV) integrate true triple-offset geometry to provide bubble-tight sealing. The result is the fully bidirectional zero-leakage shutoff valve. A range of Butterfly Valves supplied by KHD Valves Automation Pvt Ltd completely assembled with electric actuators which are small, lightweight and compact in design. KHD Valves Automation Pvt Ltd offers a wide range of flanged Butterfly Valves in various construction materials allowing them to be used in many applications. 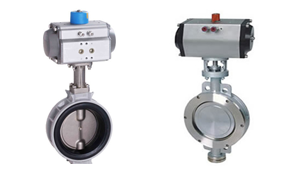 KHD Valves Automation Pvt Ltd offers a wide range of Butterfly Valves supplied completely assembled with the pneumatic single return or double acting actuators. Sizes from 1 1/2" - 12"
There are different kinds of Butterfly Valves available at KHD Valves Automation Pvt Ltd each designed to withstand different pressures and different usage. The zero-offset Butterfly valve, which uses the flexibility of rubber, has the lowest pressure rating. 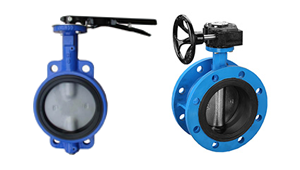 The high-performance in KHD Valves Automation Pvt Ltd's Products is double offset Butterfly valve, used in slightly higher-pressure systems, is offset from the center line of the disc seat and body seal (offset one), and the center line of the bore (offset two). This creates a cam action during operation to lift the seat out of the seal resulting in less friction that is created in the zero offset design and decreases its propensity to wear off. Operation of KHD Valves Automation Pvt Ltd's Butterfly Valves is similar to that of a Butterfly Valve, which allows for quick shut off. Butterfly Valves are favored by everyone generally because they cost less than other valves, and are lighter in weight so they need less support favor. The disc is positioned in the center of the pipe. A rod passes through the disc to an actuator on the outside of the valve. Rotating the actuator turns the disc either parallel or perpendicular to the flow. Unlike a Butterfly Valve, the disc is always present within the flow, so it induces a pressure drop, even when open. KHD Valves Automation Pvt Ltd is suppliers, dealers, exporters and manufacturers of Butterfly Valves in India. 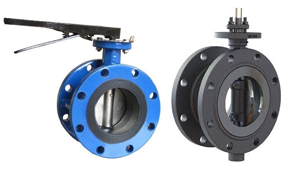 Our high-grade range of Butterfly Valves is perfect. These are designed and developed in accordance with the international quality standards. 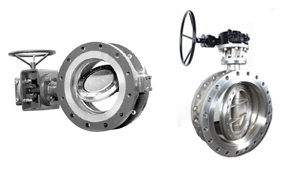 Butterfly Valves that are precisely engineered using the prime quality raw material. We offer customized Butterfly Valves as per the requirements of the clients. High-pressure and high-temperature water and steam services. Compressed air or gas applications. Easy and quickly open and shut-off. Small fluid resistance. Made Simply structured, small sized, and light weighted by KHD Valves Automation Pvt Ltd. It can transmit mud and is designed to accumulate the least amount of liquid accumulated at the outlet. Good sealing can be achieved if under low pressure. The Valves best suited for high-pressure systems is the KHD Valves Automation Pvt Ltd's triple offset Butterfly valve. In this Valves the disc seat contact axis is offset, which acts to virtually eliminate sliding contact between disc and seat. In the case of triple offset Valves, the seat is made of metal so that it can be machined such as to achieve a bubble tight shut-off when in contact with the disc. KHD Valves Automation Pvt Ltd is the best in business and world Leading dealers of Butterfly Valves. Choose KHD Valves Automation Pvt Ltd for optimum quality Valves that are made with high-grade steel which is globally approved with Best Service in the business. We manufacture Valves from the genuine guaranteed raw material with the material test certificate, hydraulic test certificates, Mill TC 3.1.b available with all supply. KHD Valves Automation Pvt Ltd have been standardized for all critical services by renowned establishments. KHD Valves is known as one of the leading manufacturers and suppliers of different types of Valves fittings such as Ball Valves, control valves, Gate valves, Globe Valves, Diaphragm valves, Pinch Valves, and many other Valves products.